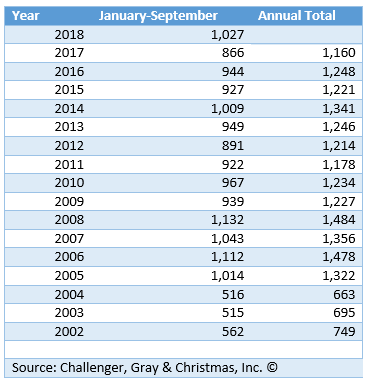 2018 September CEO Report: 148 CEO Changes Adds to Highest Quarterly Total on Record | Challenger, Gray & Christmas, Inc.
A total of 148 Chief Executive Officers left their posts in September, down 3.9 percent from the 154 announced in August, the highest monthly total on record. September departures are the second highest of the year, according to a report released Wednesday by global outplacement consultancy and executive coaching firm Challenger, Gray & Christmas, Inc.
Last month’s total is 46.5 percent higher than the 101 CEOs who left their posts in September 2017. With the exception of August, September saw the highest monthly total since May 2006, when the same number of CEOs left their posts. Third-quarter departures reached 396, the highest quarterly total of CEO changes since the firm began tracking CEO turnover in 2002. CEO changes in the third quarter were 36.5 percent higher than the 290 CEOs tracked in the second quarter and 32.4 percent higher than the 299 CEO changes recorded in the same quarter last year. “The last time we saw CEO turnover like this was in the lead up to and during the Great Recession. The difference in those years is that CEOs were leaving due to economic conditions during a period of high unemployment, which isn’t the case in 2018,” said Andrew Challenger, Vice President of Challenger, Gray & Christmas, Inc. So far this year, 1,027 CEO changes have been recorded, 18.6 percent more than the 866 CEO departures recorded last year. The nine-month total is the highest since 2008, when 1,132 CEO changes were recorded through September. By this point that year, 27 CEOs had been terminated from their positions and another 18 departures were blamed on the credit collapse. “Today, CEOs are leaving in the tightest labor market we’ve seen in decades. Their skill sets are increasingly in demand. We saw many long-time CEOs leave while their companies were performing well, with plans to expand, ready to pass the torch to planned successors,” said Challenger. “That said, some of this churn could be due to companies realigning before a potential downturn occurs, putting leaders in place who can weather a storm,” he added. The Government/Non-Profit sector leads all industries in CEO turnover this year with 204 departures, followed by the Computer sector with 109. Companies in this sector include software and web developers as well as companies that make hardware for personal computers. Financial firms follow with 103 CEO changes through September, 33.8 percent more than the 77 announced in this sector during the same period last year. Hospitals have seen 100 CEO changes, while other companies in the Health Care/Products space have announced 96. The majority of CEOs (287) have retired this year, while another 275 stepped down into other roles in their companies, typically as a Board Member or other C-Level executive. Another 100 found new positions in other companies. Sixteen saw their positions terminated, and 11 left amid scandal, five of which included allegations of sexual impropriety.